Imported Indian seal from Tell Asmar. 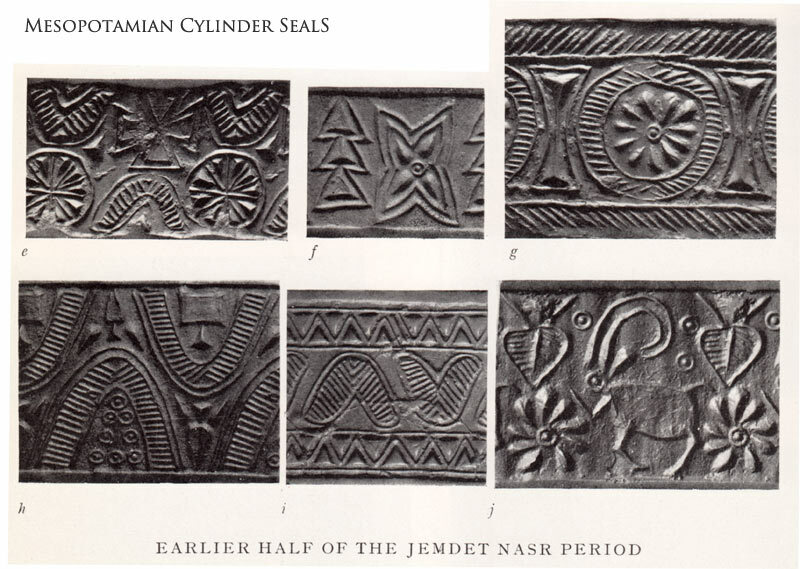 "The cylinder seals of Mesopotamia constitute her most original art," wrote the scholar Henri Frankfort, and much the same has been said about the very different square stamp seals used by the ancient Indus civilization. 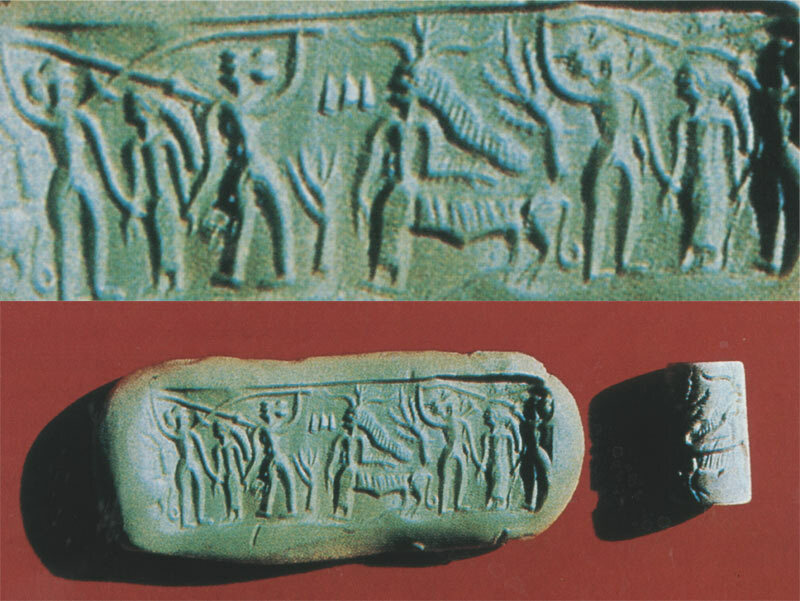 Cylinder seals are "small, barrel-shaped stone object[s] with a hole down the center, rolled on clay when soft to indicate ownership or to authenticate a document . . . used chiefly in Mesopotamia from the late 4th to the 1st millennium BCE." 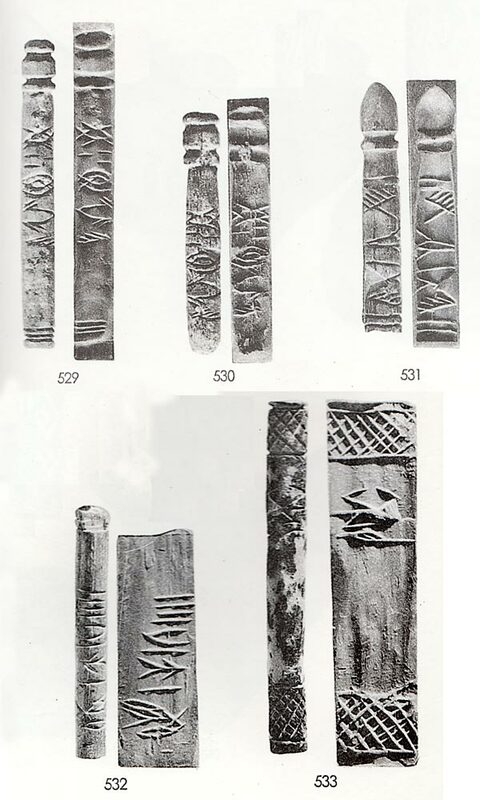 Many of the handful of cylinder seals found at ancient Indus sites or Mesopotamian ones with Indus themes are collected below. 1. Impression of a Harappan cylinder seal from Kalibangan (K-65). "Two warriors, distinguished by the hair worn in a divided bun at the back of the head, are spearing each other, while they are both being held by the hand by a goddess wearing a head-dress with a long pendant (comparable to the ones decorated with cowry shells and turquoise that are worn by the women of Ladakh and Chitral), bangles on the arms, and a skirt. 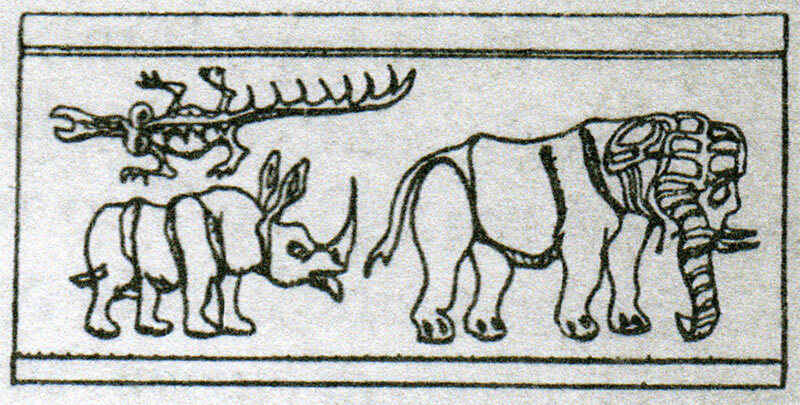 Next to the combat scene (where space appears to have prevented the depiction of those details), her body merges with that of the tiger (later the Hindu goddess of war) and her head-dress is elaborated with animal horns and a tree branch," writes Asko Parpola in Deciphering the Indus Script, p. 253. 2. "The most reliable evidence of the date of the upper levels of Mohenjo-daro still continues to be Dr. Frankfort's seal. This seal  is cylindrical in form and of a totally different shape from the majority of the seals found in the Indus valley; but as three cylindrical specimens have been found at Mohenjo-daro, all of them, it should be noted, in the upper levels of that city, it is probably that they also were sometimes used by the inhabitants . The Tell Asmar seal  is, however, certainly of Indian workmanship. Not only are the animals upon it Indian, the elephant, rhinoceros, and gharial, or fish-eating crocodile, none of which ever appears on Sumerian or Akkadian seals, but the style of the carving is undoubtedly Indian." Ernest J. Mackay, The Indus Civilization, 1935, p. 193. 4. 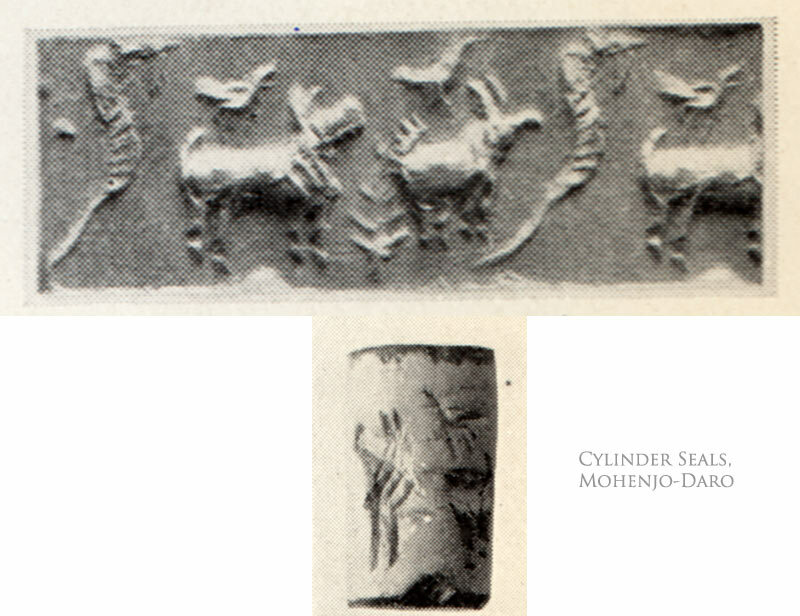 John Marshall wrote: "Seals of this group [cylinder seals, although Mackay above is not sure they are true cylinder seals]], if indeed they are seals, are very rarely found at Mohenjo-daro, only five specimen being obtained in all. They are all made of ivory and differ from the cylinder seals of other countries in being very long and thing; nor are they perforated for suspension on a cord. It is possible that these so-called seals are not true seals at all. They incised characters upon them might conceivably be identification marks for a game or something similar. On the other hand, they are certainly suitable for use a seals and in this account they are included in this chapter For the sake of clearness the actual seal is shown side by side with each impression. No 529 (Pl. CXIV, HR 5515). Ivory. 2.7 inches long by 0.25 in. in diameter. Double groove at one end for attachment of cord. The other end is decorated with three parallel grooves. Level, 4 feet below surface. Central Courtyard (30), House LIII, Block 7, HR Area. No 530 (Pl. CXIV, HR 4985). Ivory. 2.05 inches long by 0.25 in. in diameter. Double groove at one end for a cord; the other end is broken. Level 3 feet below surface. Central Courtyard (30), House LIII, Block 7, HR Area. No 531 (Pl. CXIV, DK 2666). Ivory. Now 2.05 inches long by 0.3 in. in diameter. Its polish shows that it has been much used. About one-half of the seal is covered with an inscription, deeply and roughly incised and bordered by two deep cut lines. One end of the seal is shaped into a conical head with a deep groove possibly intended for a cord. The seal is not bored; nor is it perfectly round. Level, 4 feet below surface. Street between Blocks 1 and 2, Section B, DK Area. No 532 (Pl. CXIV, VS 875). Ivory. Now 2 inches long by 0.3 in. in diameter. One end is broken and a small piece is missing. The seal tapers slightly towards its complete end. Five deeply incised characters occupy a space of about two-thirds of the circumference of the seal. Level, 12 feet below surface. Found in front of Room 70, House XXVII, VS Area. 5 and 6. 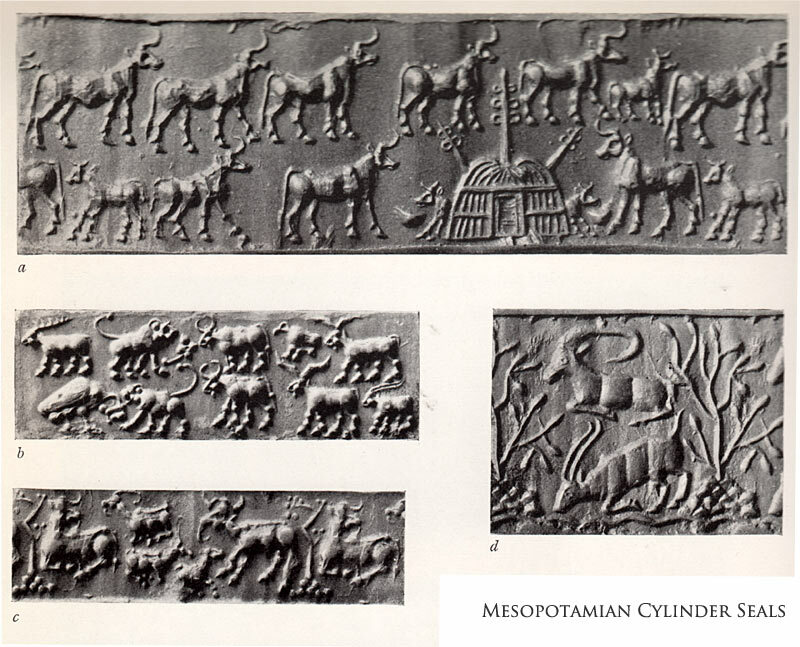 These are not Indus seals, but appear in Frankfort as seals from Mesopotamia, and bear some resemblance to the Mackay seals above [2, 3] and point to some of the similarities between the contemporaneous Mesopotamian and Indus civilizations.